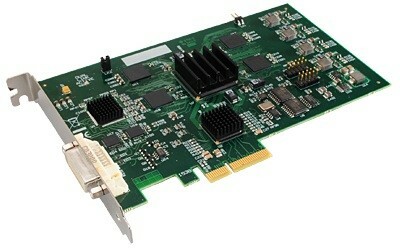 The XtremeRGB-Ex4, a standalone PCIe x4 plug in card (can be used in x8, x16 slots), delivers extreme performance with 650MB/s transfer bus bandwidth. This high industrial performance makes the XtremeRGB series ideal for a wide range of applications. The XtremeDVI-DL1 has one capture channel supporting up to 4K x 4K in Dual-Link mode and for HD 1920x1080 DVI (1920x1200 with reduced blanking). The XtremeDVI-DL1 captures the Analog/DVI data and triple buffers it into onboard storage. This data is then copied using Direct Memory Access (DMA) to the host system for display, storage or streaming. The included application includes option to either transfer video data direct to the graphics card thereby increasing performance or to transfer video data to the graphics card via system memory. The XtremeDVI-DL1 has integrated DVI equalizers on its inputs to support longer input cable lengths (up to 20m). The XtremeRGB is supplied with a stand-alone software application, simply connect your external DVI source into the card, run the XtremeRGB application to automatically detect the video source format and display the captured video in a window on your desktop. For multiple inputs the application can be executed multiple times, each capture is displayed in its own independent desktop window. The captured video data is displayed in a desktop window with/without menu/borders, can be resized up/down, overlapped and/or maximized to full screen display. The XtemeDVI-DL1 is an ideal solution for applications that require the capture of multiple DVI/HDMI video sources in real-time. The XtremeRGB is supplied with a powerful SDK for own application development, many source code examples are included to help reduce the development time. Also included are Directshow source code examples. Weiterführende Links zu "XtremeDVI-DualLink PCIe XtremeDVI-DL1"
Kundenbewertungen für "XtremeDVI-DualLink PCIe XtremeDVI-DL1"